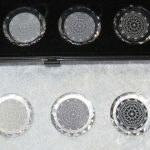 In October 2011, Peter Mandel first introduced his exciting new treatments using the Grey Facetted Crystals. The Grey Crystals have a unique capacity to open the “assigned symbolic patterns” of the individual, thereby making it easier to treat any specific symptoms or issues arising in the background. These crystals influence higher planes of Being in regards to the superordinate holograms than the grey rods. They facilitate powerful openings of emotional blockages and/or obstructions the body . We will explore the use of the grey crystals on their own, as well as in combination with the gold, silver and element crystals, including new therapies for father and mother issues, the Tree of Life, the amygdala/hippocampus, consciousness expansion and more. This webinar class is limited to certified Esogetic Colorpuncture practitioners. Cost: $165.00. Registration deadline is April 8th, in order to receive your class materials.